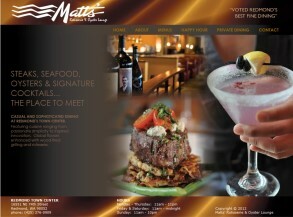 Custom website design for your restaurant goes far beyond just a few pretty pages and a menu or two. Like all web designs, your site's overall credibility will be driving force on whether or not customers will walk in your door. Restaurant Website Design by ES Interactive ensures that your establishment gets the attention and recognition it deserves. We provide top-quality, stand-out designs, custom easy-to-use CMS (content management systems) that make updating your menu items in real time a breeze. And finally, our internet marketing services will help broaden your reach via search engine optimization to help grow your business to new heights! 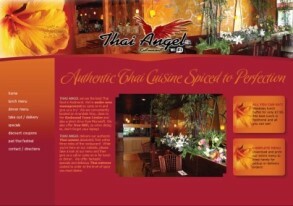 Contact Us to discuss your the design of your new restaurant website. 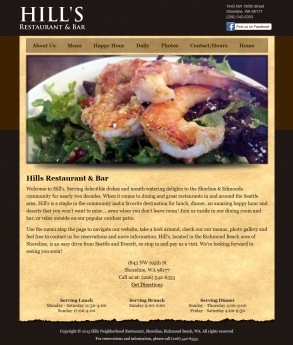 Think of building a restaurant web site almost as you would think of building a new home. A website in its simplest terms is nothing more than a series or set of organized boxes or sections that, when properly constructed, will allow a visitor easy access to just about everything he or she is looking for. Similarly, a home, no matter how complex it looks from the outside, is originally planned as a set of structured boxes, which are the rooms of the home. Any curvature, landscaping or visual niceties are merely an outside shell that is actually housing nothing more than boxes. No matter how complex a home's structure and no matter how many rooms the house has, there's always a logical flow to the home which makes sense. For example, a bedroom will often be placed on the same floor as other bedrooms and is often located near the bathrooms of the home. Bathrooms would also be situated within sensible reach of a family room or entertainment area of the house. But you'll rarely see a bedroom of a custom home placed right off the kitchen. It just wouldn't make sense. The same is true of your website structure. All of these considerations are identical to those you'll need to account for when designing or redesigning a website. In the case of your restaurant's website, you will want to now expand on the "new home" approach and think of the home actually being a physical establishment such as your restaurant; a local business that welcomes customers or people through its doors. Expanding on that thought, you'll need to consider making navigation throughout the restaurant as simple as possible. Posting signs directing people to the restrooms, placards that point out stairs, exits or elevators, and so on. This is comparable to both navigation and "calls to action" within your website, and this is the key to keeping the always impatient web visitor on your site. Make your most prominent offerings as easy to find as possible, such as your dinner menu, happy hour offerings and so on, and you're naturally less likely to lose the web visitor to another restaurant's web site. In the world of the web, you've got less than six seconds to accomplish this or the website visitor - and potential customer - is gone. It's really that simple. Get them in, keep them in, serve up information quickly and direct them to the call to action � which in your case would be a phone number, street address, driving directions and most importantly, attractive menus that are easy to navigate. Make Your First Impression Quickly and Make it Count! Consider a shopping mall. Malls have calls to action and navigational assistance everywhere. You can usually find your favorite stores or even the food court without much hassle. But this is where the necessary hook comes into play. You have all of your favorite restaurants in one area, and it's time to make a decision. You're pressed for time because you want to continue your shopping or maybe you want to get ready to head home. Time is of the essence here, and it is not always the type of food each restaurant has that makes you arrive at your final decision. Often it is a first impression, an impact, simplicity with attractiveness, cleanliness, shorter lines and an easy-to-read menu. All of these contribute to the restaurant's overall credibility and trustworthiness. This can all be equated to your website's immediate visual impact, its attractiveness, its professionalism, its message, its speed, and of course its ease of navigation. 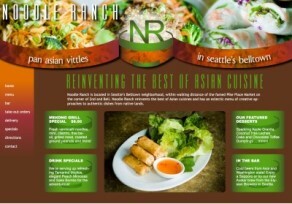 ES Interactive builds websites that work for your restaurant's bottom line. Don't become a hidden and overlooked food court restaurant. Let us turn your dining establishment into one that stands out from the crowd.